Let’s get one thing clear – I am a huge fan of standing your ground in sticking up for what’s important to you and your business. But I am not a fan of rigidity or self-righteous indignation when someone pushes those boundaries for you. And this comes up a lot when people ask for discounts. What nerve! Who do they think they are asking me to discount my amazing service, fantastic product or award-winning work? Get out! Scram! No discount for you! The problem with responding like that is that you could actually be passing on an opportunity or project that would be fabulous, if you put some work into transforming it. The other downside is that if you respond all snarky…people will talk. Response #1: Give them a discount. If you’ve built some wiggle room into your pricing, it’ll be possible for you to shave off a little bit and still be well compensated for the work you’re doing. Saying “I don’t normally give discounts, but for you, I can adjust the fee to…” is a great way to show that you’re doing something special. Response #2: Scale the price and the deliverables. Maybe you can’t hit their budget and still deliver all the bells and whistles. But for a lower price point you can still get them a bell or two. Have a streamlined version of your package or service in your back pocket as something to offer that will hit the price sweet spot and still get them great results. My challenge to you is to create that back-pocket offer you can have ready to propose to a client when budget is a concern. This isn't a freebie or a loss-leader. You're going to be earning enough from this pint sized offer to make it worth your while. No point in securing a client if they aren't going to actually experience what it's like to work with you. This is your opportunity to highlight the value you bring to their business or life, which sets the leads you into element #3. Yes, the immediate value of this client may have dropped. But don't forget about lifetime value. Bringing this client onboard at a lower price point means that their comfort level in making investments with you will increase. Make sure this pint sized offer is something that relates to the other work you do and that connection is clear. 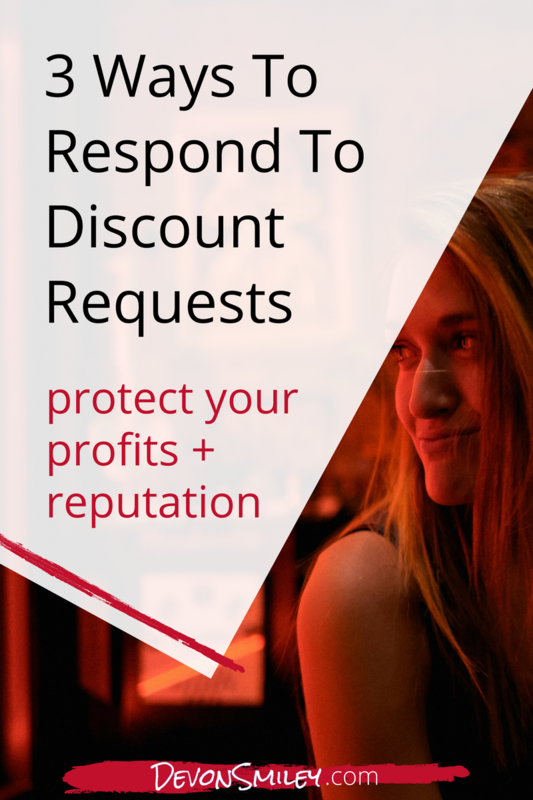 How can you translate your work into a pint sized offer that will allow you to bring in new clients without discounting your rates or missing out on profits?